My sincerest apologies for being so late in naming a winner. This past week has been horrid to say the least. Visits to the dentist, the endodontist, back to the dentist and now back to the endodontist for a root canal next week, yuck! On top of that, my mom has been having neck issues and there was testing and then xrays for that and physical therapy. She's doing much better and I'm hopeful the craziness will stop. The name I drew was Crystal - congratulations, Crystal! I have your email address and will be in touch this afternoon to confirm your book choices. Thanks to everyone who commented and again, I apologize for being late with the winner. Rachel Bailey was a new author to me until I read COUNTERING HIS CLAIM (in exchange for an honest review). I'm oh so very pleased to have found her! Her latest book, COUNTERING HIS CLAIM (Harlequin Desire) is a positively lovely story. To top it off, look at how classy this cover is! It's definitely one of the best I've seen in a long, long time. Never be distracted by a woman is hotel magnate Luke Marlow's golden rule, especially when the woman just inherited half his late uncle's luxury cruise liner. But ship's doctor Della Walsh is the exception. Her dignified beauty ignites Luke's desire despite his suspicions. Even so, he will gain full control of the ship at all costs. For Della, the ship has been a sanctuary. Now she has just three weeks to change Luke's mind and save the ship—until passion comes along and steers them off course…. Della Walsh is a doctor on the Cora Mae cruise ship. When the owner of the ship dies, Della is heartbroken and, like everyone else working on the ship, is more than a little anxious to learn what the owner's nephew, undoubtedly the beneficiary of the ship, will do with it. When the will is read and Della and Luke each receive a one-half interest in the ship, Della is stunned and Luke is not pleased. Luke's family has been in the business of hospitality and Luke wants to buy Della's share and dock the ship and turn it into a floating hotel. He understands where Della is coming from in wanting to keep the ship active as a luxury cruise liner, but refuses to let his attraction to her get in the way of his plans. Della and Luke are each more than a little damaged from events in their pasts. Della, having grown up on cruise ships, feels very strongly about keeping the ship out on the water and Luke is equally determined to turn it into a hotel. Their attraction to each other is instantaneous, but they don't act on it immediately which is a nice example of story building. Ms. Bailey's work should be enjoyed by all romance readers. I'm off to shop her back list! I've decided to do a giveaway of two books from Ms. Bailey's back list in Kindle or Nook version (subject to availability) to one lucky reader here. If you're interested, please leave a comment. Have you ever been on a cruise? Have you read Rachel Bailey's work? Which two books would you choose if you win? Any and all comments are welcome! You know the drill, if you send a friend over who mentions you in their comment and you'll each get your names in the draw an extra time. I'll draw the winning name on Monday, October 14. Leave your email with your comment and I'll contact you if you're the winner. Otherwise, be sure to check back. 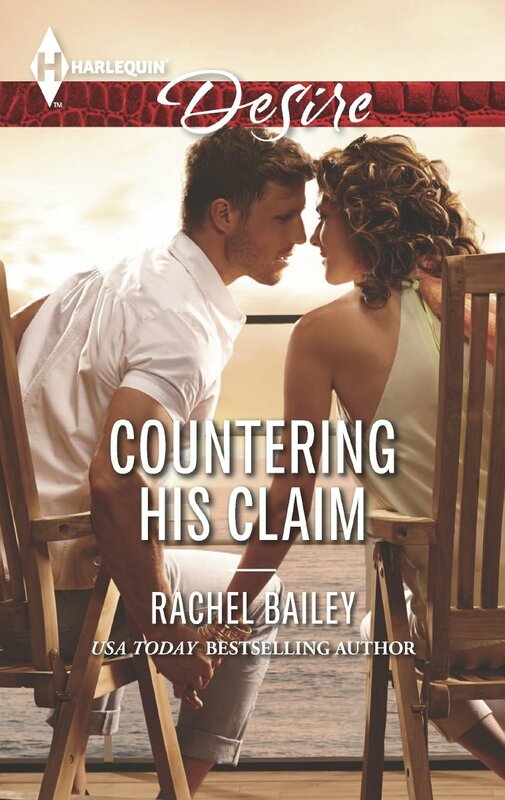 Thanks to Rachel Bailey for allowing me to read and review COUNTERING HIS CLAIM for you - I absolutely loved Della and Luke and look forward to reading more of your work. I have never read this author or been on a cruise! I think I would love to though. I have not read any books by Rachel Bailey. Thanks for the introduction. I did like the storylines of her books. If I win I would love to read the 5 star reviewed AT THE BILLIONAIRE'S BECK AND CALL & MILLION DOLLAR AMNESIA SCANDAL. I have never been on a cruise and I have no desire to go on one. I don't like the idea of being with so many people out at sea. I have not read any of Rachel Bailey's books. They sound good though. I also have not been on a cruise. I would choose What Happens In Charleston and Claiming His Bought Bride. I've been on a couple of cruises. We stopped in Key West and Cozumel. I have enjoyed Rachel's books including "At the Billionaire's Beck and Call?" I would probably choose to win a copy of "No Stranger to Scandal" and "Return of the Secret Heir." I have not been on a cruise and have not read any of Ms. Bailey's books, though I'm definitely going to give them a try. If chosen, I would pick Million-Dollar Amnesia Scandal and Claiming His Bought Bride. Thanks for the opportunity. I've survived a root canal! You will too! Thoughts and ramblings guaranteed to put you to sleep. I've been married for 34 years (yes, Hub robbed the cradle), have two beautiful daughters, 23 and 28. We have a basset hound, Simon, and three cats, Sophie, Tony and Penny. I work full-time as a legal assistant. I enjoy reading, baking and walking. I write book reviews for the online review site, Romance Junkies. It is the responsibility of anyone who enters a contest on my blog to stop back and find out if they're a winner. I will not attempt to track you down. If I don't hear from a winner within the number of days specified when the winner is announced, I will draw a new name. Unless otherwise indicated, all contests are limited to US/Canada addresses only. ONE CLICK COULD SAVE A LIFE! Johnnie Fedora and Alice Bluebonnet - so very sweet! Cat herding commercial - too funny!